Cafe "De Bruine Boon" (The Brown Bean) is a famous cafe in Leiden. 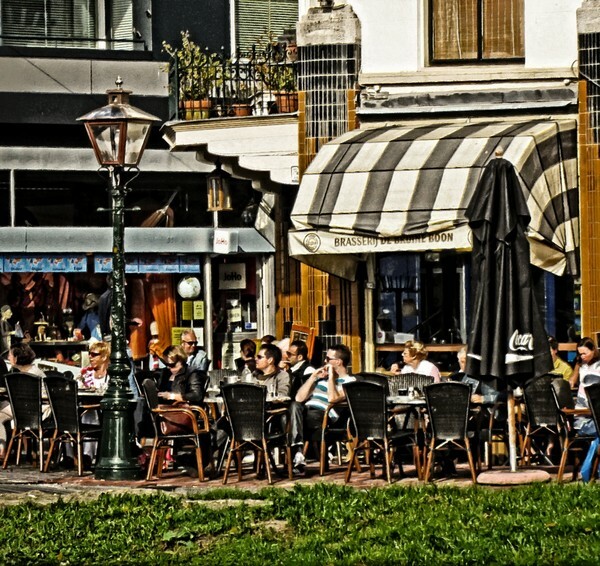 A place for students, tourists and inhabitants of Leiden. To enjoy a great coffee and homemade applepie in the sun and just being lazy. For discussing the serious and light-hearted aspects of life and enjoying each others company....PhotArt with a photo of myself. Artist Reply: Thank you very much Heloise Have a fine weekend! VERY BEAUTIFUL AND LOVE THE STYLE, GABRIELLE MARIE. Artist Reply: Thank you dear Sharon about the style compliment! great capture and wonderfull place, superb effect for the postwork,love it.well done my friend. Artist Reply: It is Stefani... it is.. A wonderful place without any stress..Thank you! Artist Reply: Thank you very much Maria Anna!